As a part of the Operational Readiness investigations, and we thought sometimes just to cause us grief, USAF aircraft tried to penetrate, without being detected, our radar coverage. The worst of these aircraft had to be the B-57's. With such a small head-on radar profile, they could often get to about 150 miles before we could detect them. 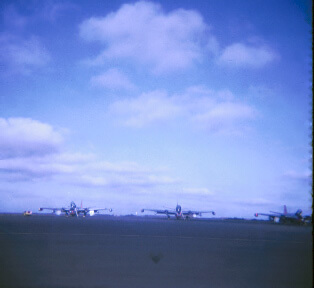 I can not recall exactly what our nickname for these B-57's was but suffice to say, it was not very respectful. Shown here, at the Keflavik base, is one of those *%&***& B-57's.